Overview: Timor is an island at the southern end of Southeast Asia, north of the Timor Sea. It is divided between an independent sovereign state, East Timor (Timor-Leste), and West Timor, which is part of the Indonesian province of East Nusa Tenggara. The island is characterized by ethnic and linguistic diversity. 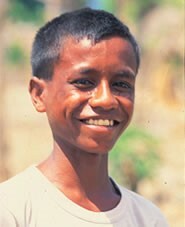 Christianity is the dominant religion throughout Timor, accounting for nearly 90% of the population, with Roman Catholics outnumbering Protestants.